Jean P. Dawson, 70 of Pasadena passed away on May 9, 2018. Jean was born on March 17, 1948 in Baltimore to the late Edward Henry and Mary Florence Kwiatkowski (Flower). 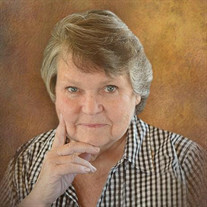 She is survived by her beloved husband of 46 years, Cliff Dawson; her devoted daughter, Erin Miller and her husband, Dean; her step daughter, Lynne Arnold; her loving siblings, Sharon Currie, David Flower and his wife, Sheri; and Danny Flower and his wife, Lori; and four loving nieces and nephew. Jean loved being with her family, gardening, traveling, going to the beach and gospel music, especially the Gaither's music. She will be deeply missed by all. The family will receive visitors at Singleton Funeral & Cremation Services, P.A., 1 2nd Ave. SW (at Crain Hwy) on Sunday, May 13th from 2-4 & 6-8 pm. A Funeral Service will be held on Monday at 1 PM in the funeral home chapel. Interment Meadowridge Memorial Park.